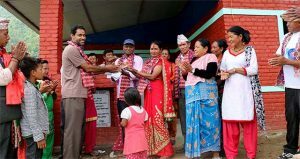 The grand inauguration and handing over of the multi-purpose activity center for women at Suri, Dolakha was held on Friday, 16 June 2017 at 12:30 PM. Due to 25th April 2015 devastating earthquake, the Dolakha District had caused prevalent damage. Suri is one of the Rural Municipality (Gaupalika) in Dolakaha District having 757 household consisting of 3380 living population according to of census 2058 Nepal. Earlier, at around 11:30 am, ceremonial welcome was accorded to the NJSI team with Fr. Bonyface Tigga SJ, the chairperson, Fr. Roy Sebastian SJ, the Director, Fr. Arulanandam SJ, the District In-charge and Fr. Anup of NJSI at the building, with women lined up with flower and tika. Thereafter, all the dignitaries along with village committee members proceeded to their respective seats and the ceremony gets heat up with National anthem. Fr. Bonyface Tigga SJ and Gaurisankar Rural Municipality Chairperson Sovam Bahadur Khadka lighted the ceremonial by inaugurating to conduct the program. The handing over of the newly build building was conducted by NJSI Director Fr. Roy Sebastian SJ to surel women village committee chairperson Saraswati Surel. The newly build women’s center consist of two room with the well-furnished door, carpet and window providing 15 tailoring machine for the suri women. It was not possible to build such beautiful building in such remote area without support from Missio Achen (Germany) with hard work of NJSI in cooperation with the village committee and local people. The village is very vast and the women’s center is now one of the attractive architecture of the community as ever build in such good physical environment. Being almost 200 kilometers the Far East from the capital of Nepal t he possibility to transport all those bricks and necessary raw material seems to be more challenging but NJSI District In-charge Fr. Arulanandam SJ make it come true in an only two-month time frame. Fr. Bonyface Tigga SJ, the chairperson, Fr.Roy Sebastian SJ, the director,Fr. Arulanandam SJ, the District In-charge of NJSI thanked the entire community for their cooperation and encouraged the suri women to make best of the facilities that is provided by NJSI and assured them for further support.